Hi everyone! 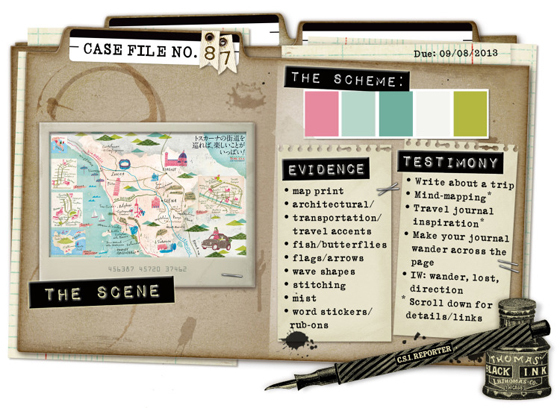 Today I am sharing my layout for CSI:Color, Stories, Inspiration case file #87, still on the August travel theme. I found this photo of my sister and me, having barbequed hot dogs over an open fire on an excursion or trip. This was and still is a very common thing to do on excursions and camps, and my journaling is about my memories from such camps. From the evidence list I used: map print, butterflies, arrows, flags, wave shapes (wavy labels, scallops), word stickers and rub-ons. 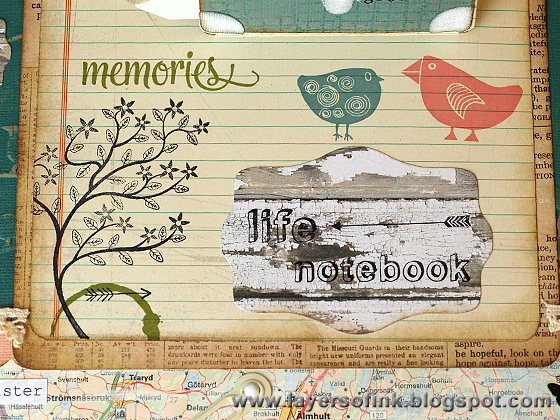 The layout is about memories from a lot of different trips. 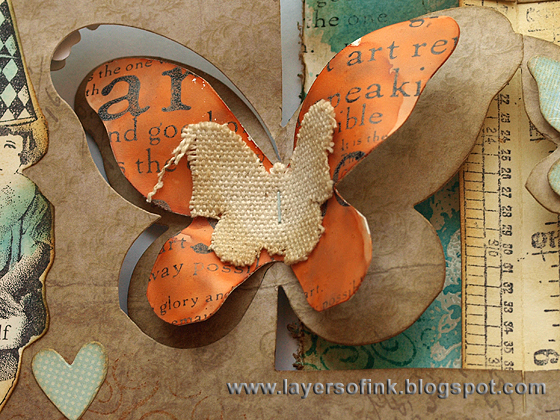 The butterflies were die cut three times from patterned paper and layered. Kraft-Core papers were embossed in three different folders, sanded and inked. Here I used the great Birds folder. 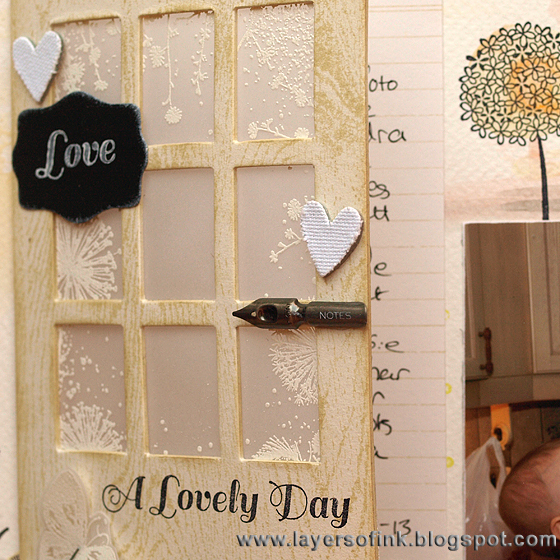 I love the sentiment on this embossing folder, and placed it so that it was above the photo. The three flags were die cut with the Flagpole w/Lantern & Sign, folded and glued to paper string. Two rub-ons were applied to the flags. I used the brand new Carved Birds Vol. 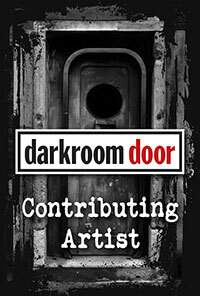 2 from Darkroom Door, designed by my stamping friend Godelieve Tijskens. You might know that I love birds, and these are so cute. They were stamped with Archival Inks and cut out. A lot of the camps took place in forests, often close to lakes, so pine trees fit well on the layout. Die cut from Core'dinations cardstock, sanded and inked. 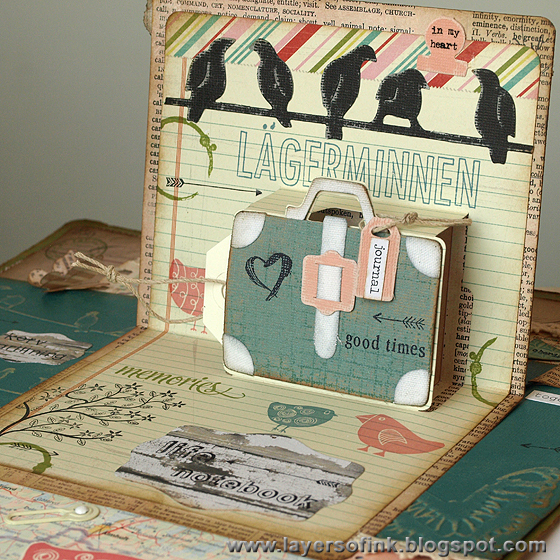 Karen Burniston's 3-D Suitcase pop-up is perfect for layouts with a travel theme. I die cut it from BasicGrey paper and used the coordinating Suitcase die to embellish the suitcase, it cuts a slightly smaller suitcase, a handle, corners, ribbon, and a little tag. I had a left-over Birds on a Wire die cut and used it here. The background was stamped with a tree, carved birds, circles and arrows. I wanted my journaling to be inside the suitcase and stapled the suitcase to the pop-up, at the corners only and left enough space to tuck in a little tag book. The corners, handle and closure ribbon were die cut from sticky-back canvas. The corners hide the staples underneath. 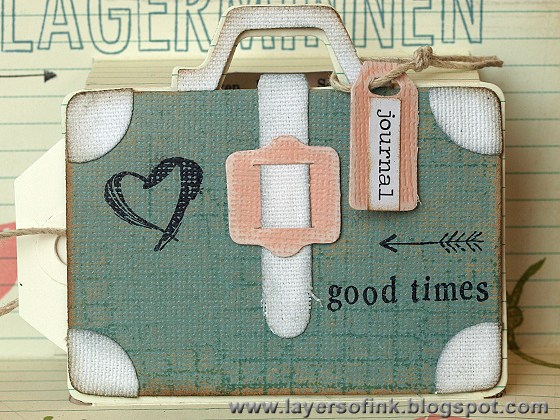 I also stamped the suitcase with a grid stamp. 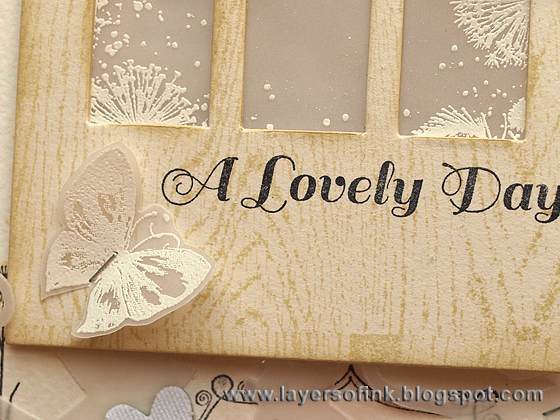 A wavy label was die cut from wood paper and stamped with sentiment stamps. Love the little birds chatting to each other. Thank you for looking! I hope you can join us this week! Stamps: Darkroom Door: Carved Birds Vol. 2; Hero Arts: My Words CL695, Stepping Stone Alphabet 330055, Windy Tree H4918, Remember AC028, Time AC029, Texture & Shape LP283, Basic Lowercase Letters LL188; Stampers Anonymous Tim Holtz Ultimate Grunge. Hi everyone! 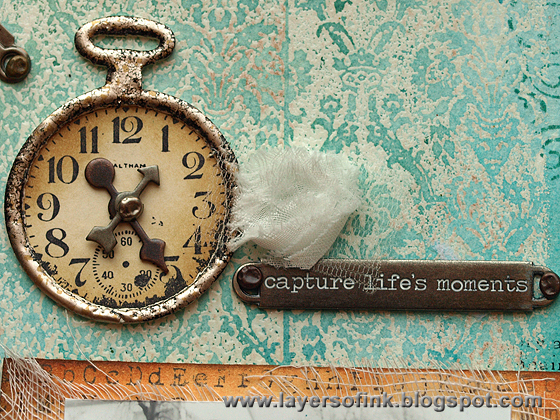 Today I am sharing my versions of Tim Holtz 12 tags of 2013 August. I love masking techniques and how much dimension you can get on a flat surface with these techniques. I made two tags. 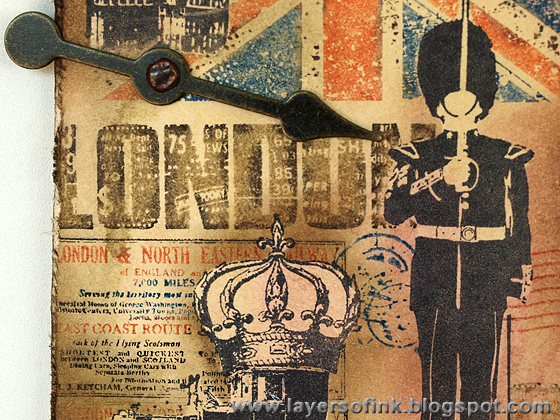 For the first tag, I used London images from the Paris to London set, which I hadn't inked up yet. The background was done with Antique Linen, Frayed Burlap and Victorian Velvet Distress Stain. Big Ben, the man, the car and the crown on top of the car were all masked. I don't have Tim's masking sheets, instead I used Eclipse tape. The flag was perfect for stamping with markers, since it looks really good stamped in red and blue. 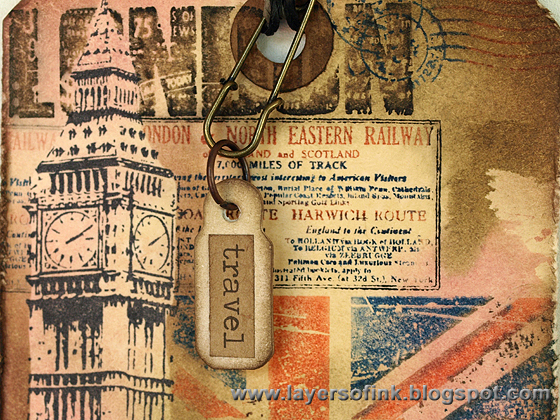 For the rest of the background stamping I used a shipping stamp, partly because I travelled by boat twice to go and visit London. 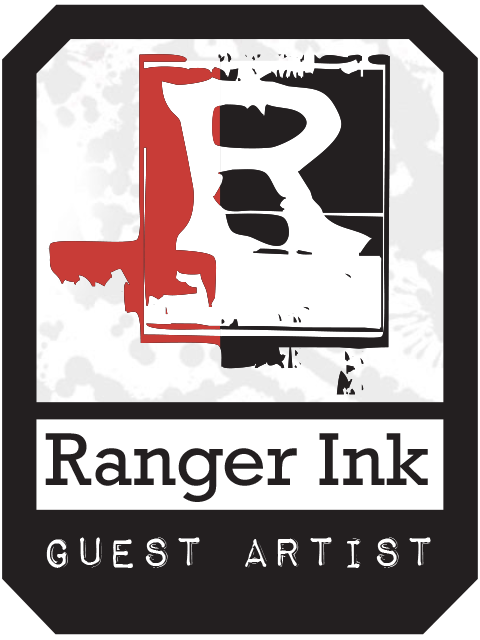 It was inked with Barn Door, Faded Jeans and Black Soot distress markers. I also used a postage stamp. 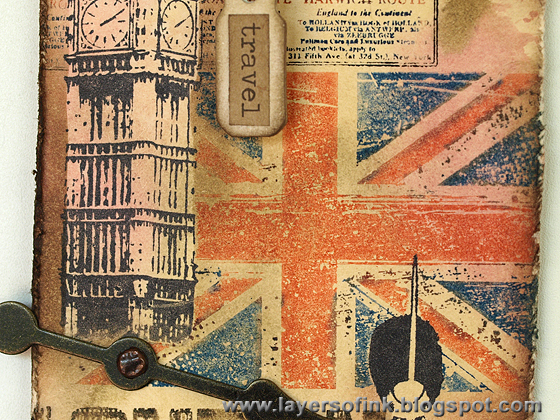 'London' was first inked with Frayed Burlap and then I dragged a Black Soot marker around the edges before stamping, which is a fun technique to do with these types of bold stamps. I also added a game spinner. The tiny tag was die cut from mat board, inked and a Chit Chat sticker was adhered on top. 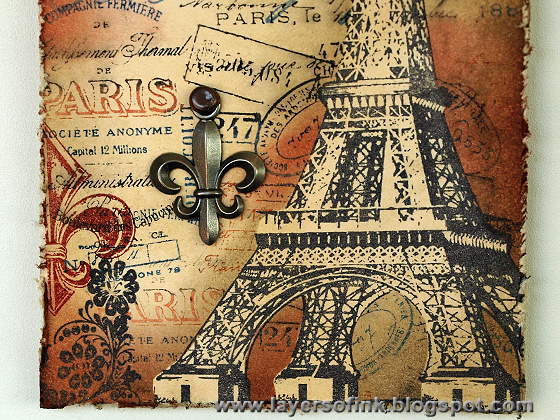 On the second tag, I travelled to Paris. 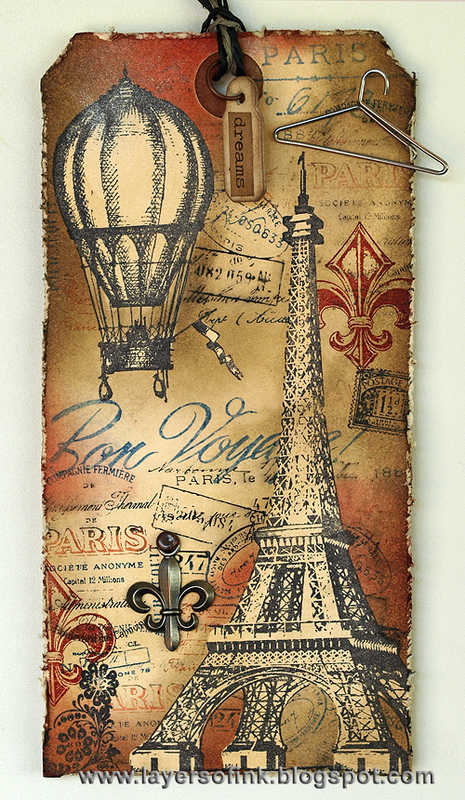 The background was done with Antique Linen, Frayed Burlap and Brushed Pewter Distress Stain. 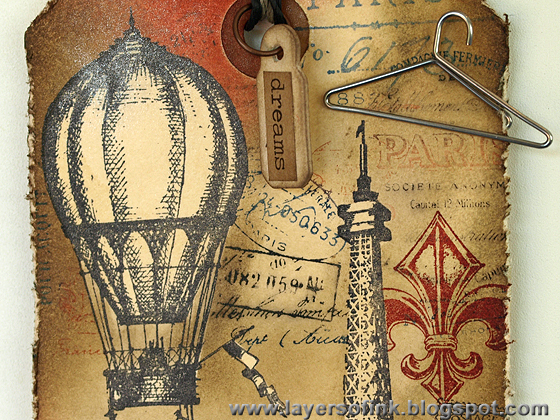 The Eiffel Tower and the hot-air balloon were masked and a Paris text stamp, a fleur-de-lie, a postage stamp and Bon Voyage were stamped on top, with Barn Door, Faded Jeans and Black Soot Distress Markers. The background was inked with Frayed Burlap, Walnut Stain and Fired Brick. After removing the mask, I added some ink between the ropes of the balloon, so that it would look more natural, another option would have been to have masked the basket and the balloon separately. I love the look of the masked flag and how it stands out from the background. The tag was die cut from mat board and inked. I also added a little clothes hanger. The Eiffel Tower really looks dimensional and not as if it is part of the same one layer tag. A metallic fleur-de-lie finished the tag. Here are both tags together. Hello everyone! 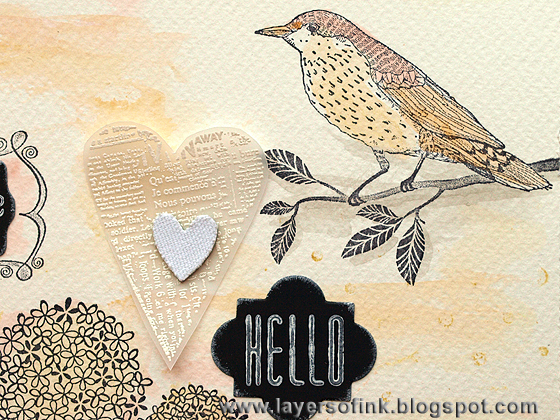 Time for another fun Simon Says Stamp Monday Challenge Blog, this week we are all about dots. 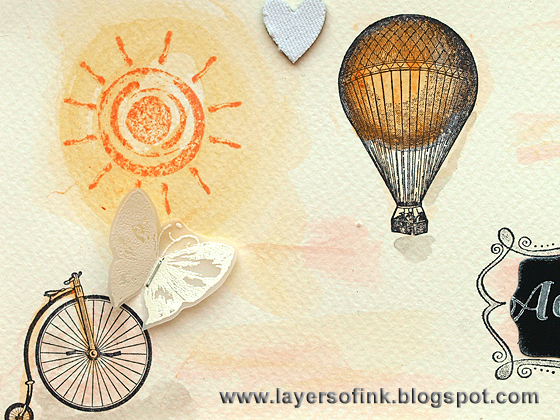 I love using dots and circles in my art and often reach for dotty stamps or stencils. They work for almost every topic and are great both as main elements and to add just a bit of texture. 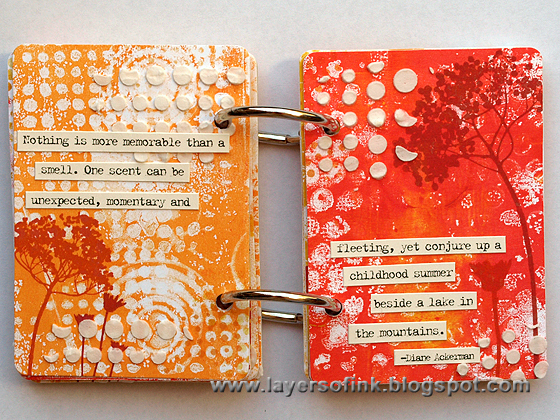 I recently got a gelli plate and I love it, so much fun and you can create fabulous backgrounds. I made a whole bunch of prints and first planned to make three ATCs but I liked my papers so much, I made an ATC mini-book instead. For the summer challenge a few weeks ago, I collected quotes about summer and sunshine, but then decided to make a burlap panel instead. This happy little book was the perfect home for those quotes. 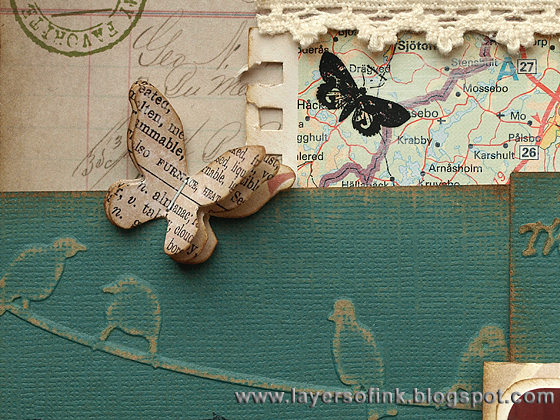 The Birds by Tim Holtz stamped on the cover is one of my all-time favourite stamps. This was only the second time I used my gelli plate and I was so absorbed by the process that I forgot to take step-by-step photos. 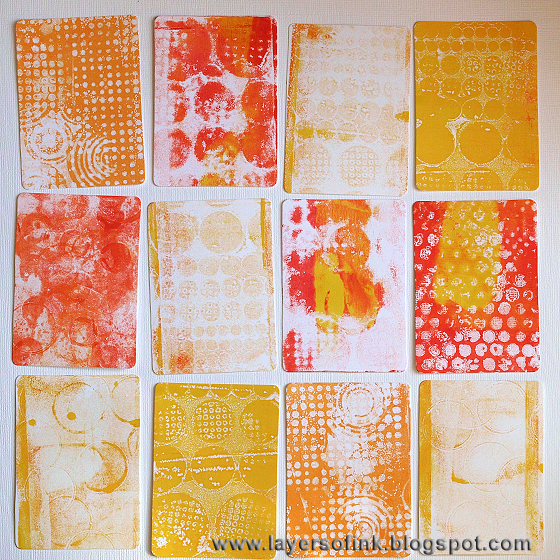 After this project, I did another one and I'll be sharing a gelli plate tutorial next week. 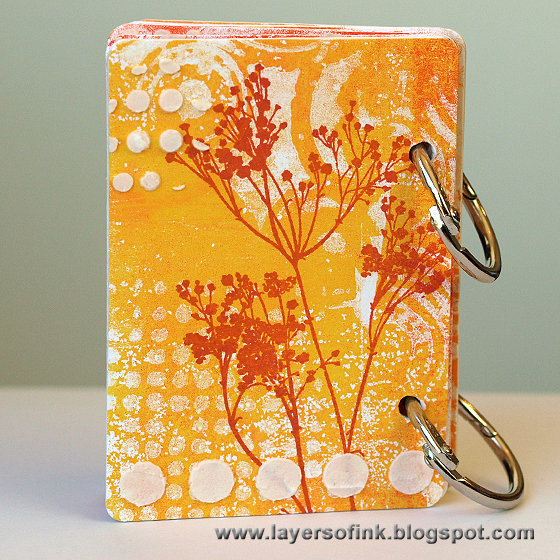 I used three Distress Paints to make these papers (Barn Door, Spiced Marmalade, Mustard Seed), together with stencils, stamps and embossing folders. 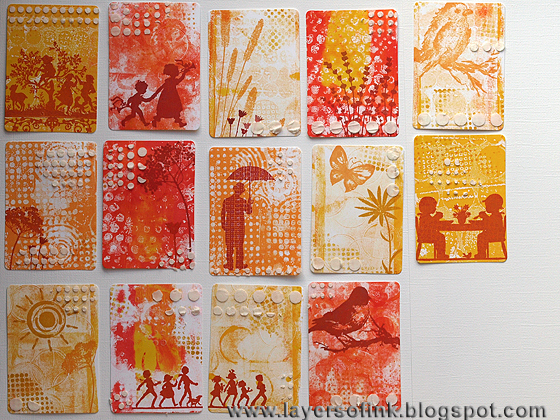 I poured out a few drops of Distress Paint on the plate and spread with a brayer. If you find that your Distress Paint beads up on the plate, wash the plate with water and soap and do one or two test runs, after that the Distress Paints worked real well. It is a thin paint, which is why it might at first bead up. 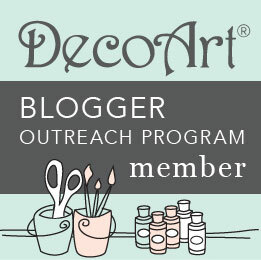 When the paint was spread into a thin layer on the plate, I pressed circle and dot stencils, dot stamps, the lid of the paint dabber bottles and paper that had been embossed (Dot Matrix, Bubble, and Retro Circles folders), into it. I used more than one stencil, stamp or embossed paper for each print and placed a piece of Neenah cardstock (14 x 14 cm) on top, smoothing it with my hands. Pull the paper off and you have a really cool print. Without adding more paint, place a second piece of paper on top to get the ghost print - see the paler prints. I used strips of left over paper to pull off the last paint, especially the paint that remained along the edges, which gave cool borders to the strips. You can easily add layers of patterns and colour, but I decided to keep my prints pretty simple this time, since I was planning to add stamping on top. 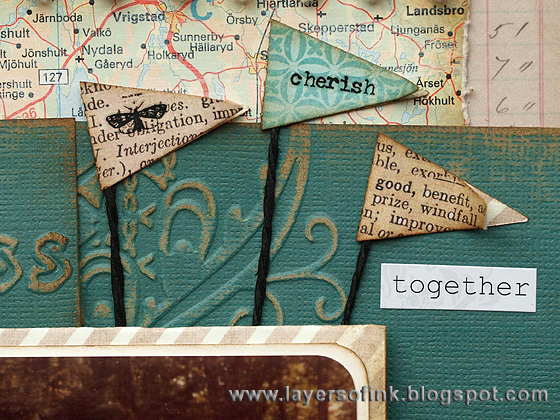 I picked out some of my favourite prints, in all the three colours and die cut with Tim Holtz ATC & Corners die. For the covers, I used mat board. I have a lot of left-over papers for another project. I looked through my stamps and picked out summery stamps, some specifically to fit with the quotes. 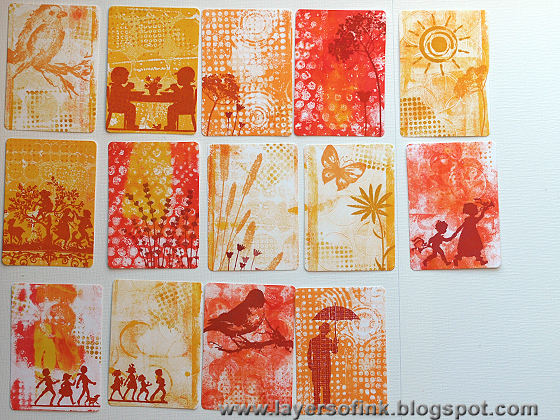 I used quite a few silhouette stamps since the bold images look great on the backgrounds. 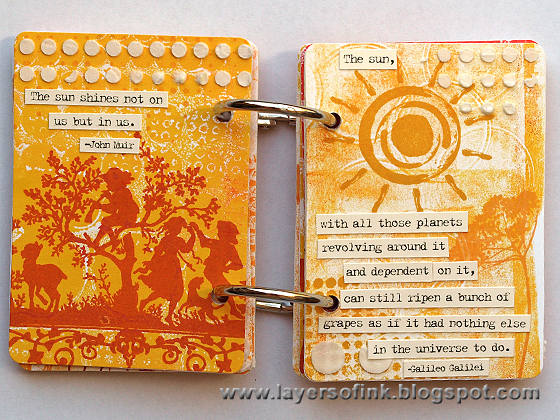 The stamping was done with Archival Inks (Saffron, Monarch Orange, Venetian Orange, Sienna, Vermillion). I also stamped the cards here and there with the dot stamp from Tim's Psychedelic Grunge set, using tone-on-tone colours. I planned where all the quotes would go, since some needed a double page. I wanted to add another layer of dots and used a Studio Calico stencil with different sized dots and applied Wendy Vecchi's embossing paste with a palette knife, adding dots here and there. The quotes were printed and cut into strips. I loved the way the umbrella man fits together with this great quote about an invincible summer. The stamps on the second page come from Hero Arts My Favorite and My Notebook set. This quote was long and needed two pages. The stamps on these two pages are from Darkroom Door. I like the way the yellow paint almost looks like sunshine on the second page. A pretty Hero Arts silhouette stamp, perfect for this little book. The Archival Inks look wonderful on the prints and because the Distress Paints are matte, the inks pick that up too and look like they are part of a the print. The quote on the second page was almost too long, but I really wanted to use it, especially together with the Hero Arts sun stamp. Another double pager, using the great Hero Arts It's a Parade stamp across both pages. I should have punched the holes first, because one ended up on the little girl's head. Both these prints are ghost prints. I didn't clean the plate between prints, giving some great random effects. 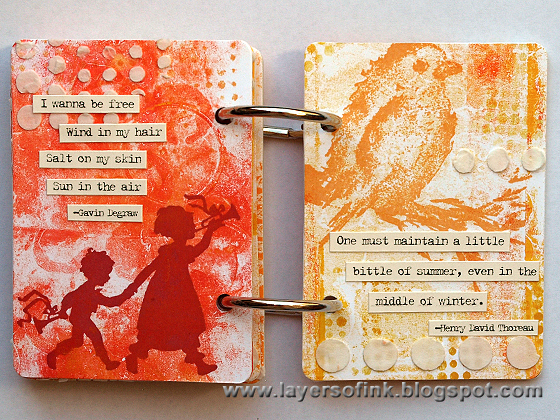 The circles on the second page were made with the lids of the paint bottles. I used my ATG gun to adhere the pages together, back to back, planning the order so that there would be different colours on each page. The stamps on these pages are from Darkroom Door. 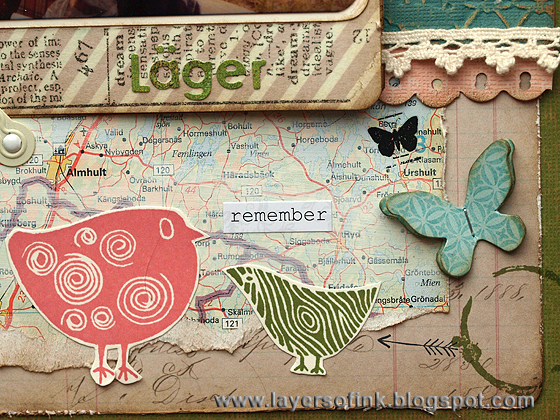 This bird stamp by Tim is another favourite of mine and I liked it together with the pretty quote about a summer's night. 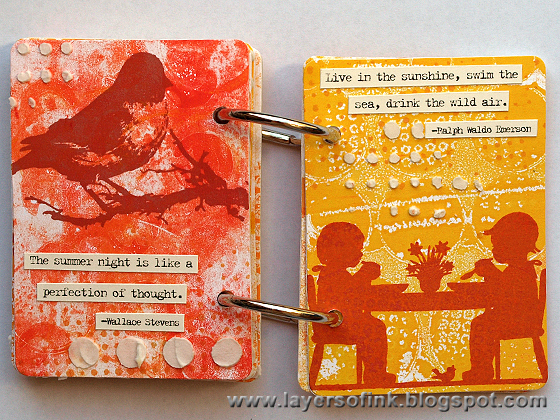 On the second page, I used another silhouette stamp by Hero Arts together with a quote by Ralph Waldo Emerson which I really like. This Musical Walk stamp has so much joy and I've used it quite a few times. On the second page, I used a sweet bird by Impression Obsessions, which was waiting to be inked up for the first time and paired it up with another great quote about summer (and winter). For the covers, I simply attached the prints to the ATC cards die cut from mat board. The holes were punched with my Crop-a-dile, first making a template to make sure they were all in the same place. This flower stamp is from Tim Holtz. I am looking forward to seeing all your projects using dots this week. As always, one lucky participant wins a $50 gift voucher to Simon Says Stamp. 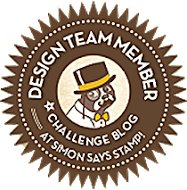 Also, remember that our challenge changed name about a month ago, from Simon Says Stamp & Show to Simon Says Stamp Monday Challenge Blog, but everything else remains the same. Hello and welcome! 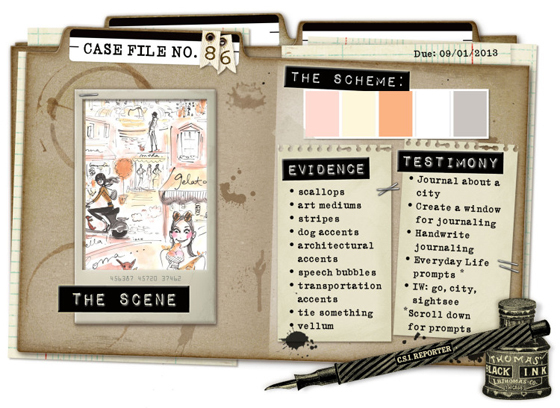 We have another lovely case file for you at CSI: Color, Stories, Inspiration this week. If you have never played along at CSI, I hope you will join us, it is such a friendly place and a really great challenge. You might know that I love watercolours, so I was pretty inspired by this week's inspiration photo. I have pile of 'waiting to be scrapped photos' on my desk, and this photo of my sister holding my son when he was a baby has been on top of that pile for a while. I love the way they look at each other on the photo and he really admires his fun aunt. From the evidence items I used: art medium (gelatos - since the word is even written on the inspiration photo), vellum and transportation images. From the testimony, I made a window and placed my journaling behind it, and also handwrote the journaling. The background is watercolour paper. 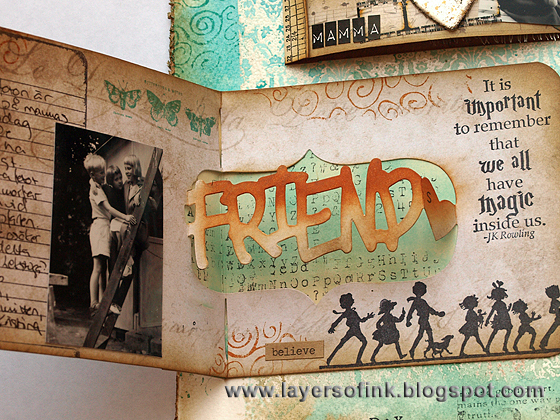 I stamped it with a mix of images and then coloured with Faber-Castell Gelatos. 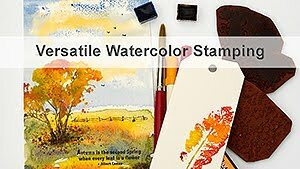 You can get the same effect with watercolours or Distress Ink. The stamps are from Hero Arts. I love this bird stamp. The heart was white embossed on vellum. The small hearts were die cut from grungeboard covered with sticky-back canvas, using the great Flower & Heart die, which cuts five hearts at once. 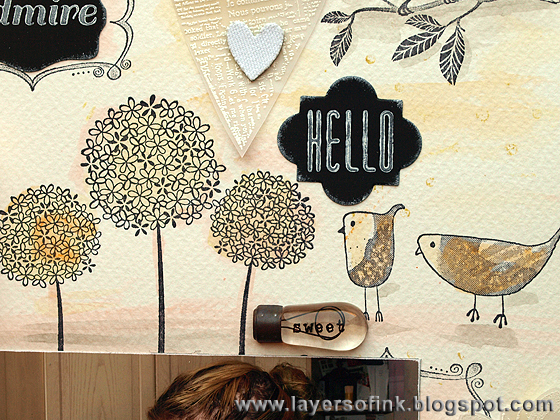 The cafe look of the inspiration photo made me think of this chalkboard paper my stamping friend Jan sent me. 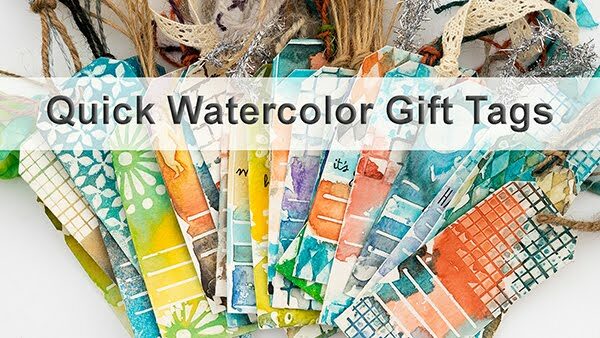 I die cut labels from it, using Karen Burniston's Funky Labels and Wavy Labels dies and stamped words with Picket Fence Distress Paint. I was happy to discover that the smallest wavy label fit perfectly inside the doodled frame stamp. These fun flowers and the birds are some of my favourite Hero Arts stamps. I used a grey Gelato to paint shadows under all the stamped shapes. The Gelatos were applied with a paint brush and not directly to the paper with the crayon, for a softer and more fluid effect. The photo is taken in my parents' kitchen and they have two cabinets with frosted glass, I tried to imitate that on my layout and made a window with Eileen Hull's Window Box die. It was die cut from mat board and stamped with a woodgrain stamp and Antique Linen, ending up looking very similar to the kitchen cabinets. 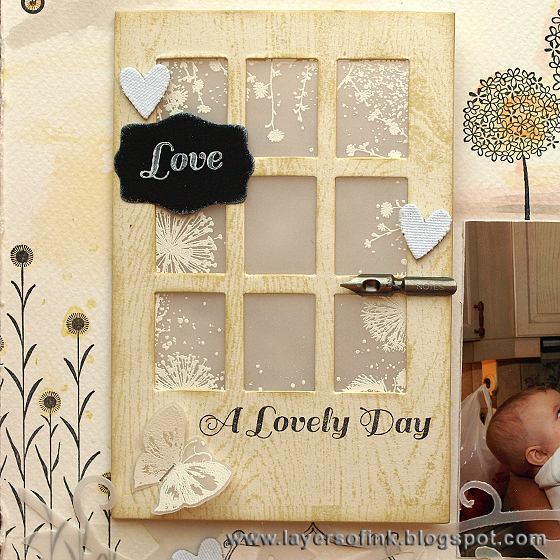 To make frosted windows, I used vellum, which was first white embossed with the Dandelion Frame stamp. I used a pen nib as a handle. The window opens and the journaling is written behind it. 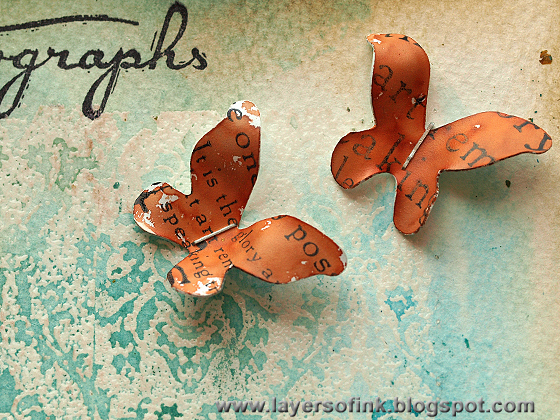 The butterflies were white embossed on vellum and stapled to the layout. The vine was die cut from vellum and the little banner from white cardstock. Hello! 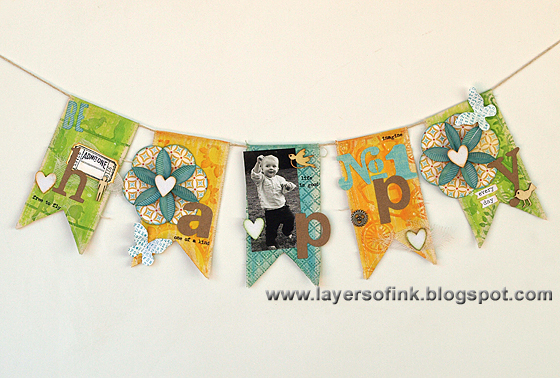 Today I am sharing a quick and fun banner on the Sizzix blog. 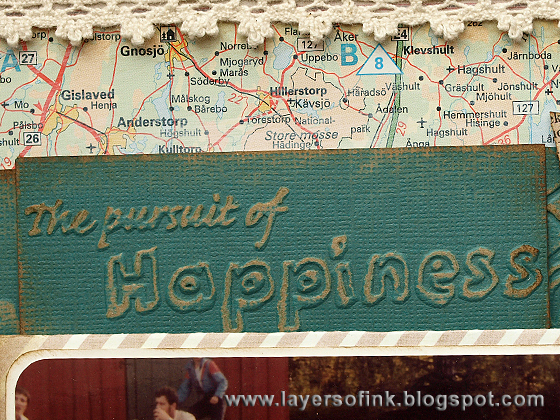 I was first planning to place this banner on a layout, but then decided to make something that can be displayed. I might put it on a layout later. 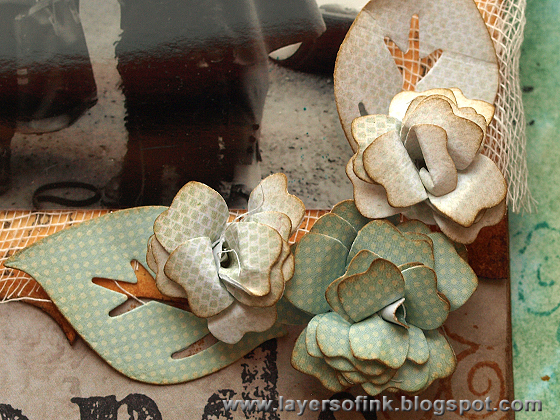 It was made with the new Banners die and the flowers were made with the Folded Flower die. 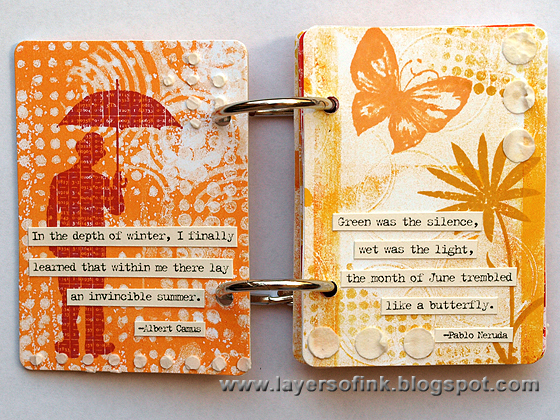 I also used five different embossing folders, Gelatos and some more dies. 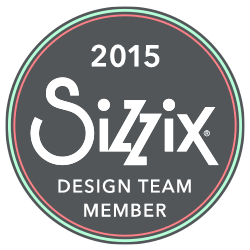 For close-ups and more info about how I made this, head over to the Sizzix blog. 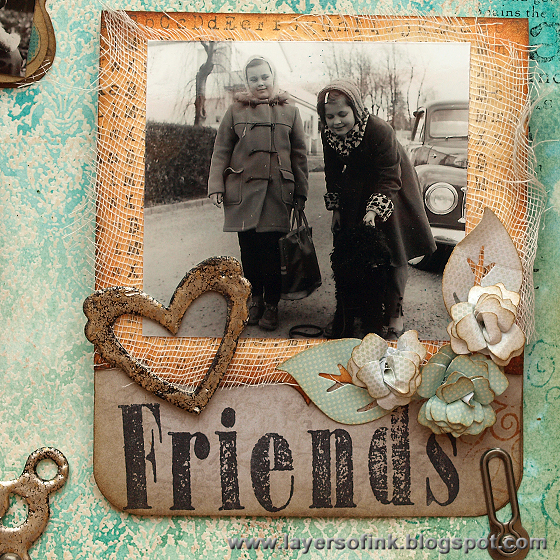 While you are there, don't miss Eileen Hull's post, also featuring two of my layouts. Hi everyone! 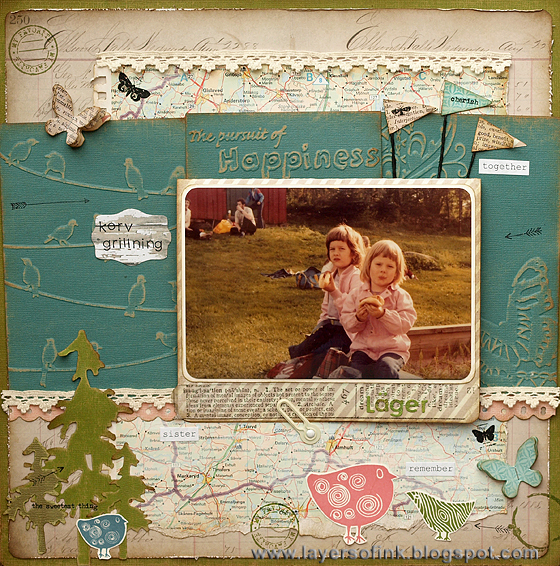 Today I am sharing a layout with three pop-up elements, which I made as a sample layout for Jennifer Grace's Projects that WOW online class in June this year. I love using interactive elements on my projects, creating little surprises for the viewer to discover. 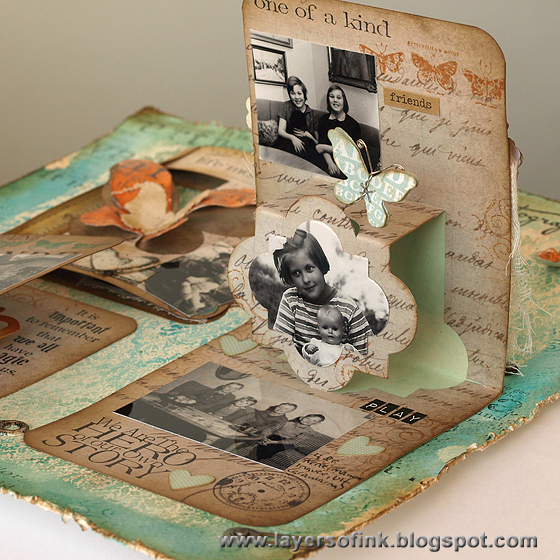 All the three flaps on this layout open to reveal different pop-ups, made with Karen Burniston’s Sizzix Journey dies. Pop-ups aren’t only for cards, but are perfect for layouts too, they are so much fun and give extra space for additional photos, journaling and embellishments. 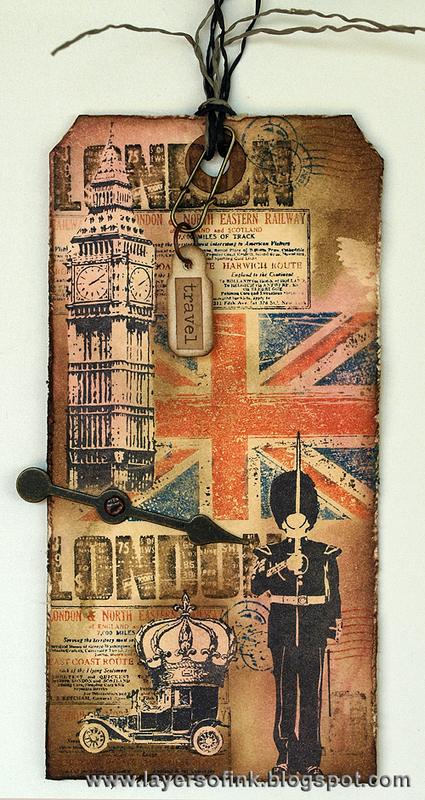 The background is watercolour cardstock and Tim Holtz wallpaper stamp was stamped repeatedly and clear embossed. I smeared Distress Stains on my craft sheet, misted the paper with water and pressed into the ink. The embossing resists the ink. I also stamped the background with a bunch of different stamps, using Archival Jet Black ink and Peacock Feathers Distress Ink. The first pop-up is made with the 3-D Butterfly Window. For a tutorial using the Butterfly Window die, check out this project of mine. Here, I placed it inside the new pop 'n cuts base die, which cuts a square card with an ornate edge. 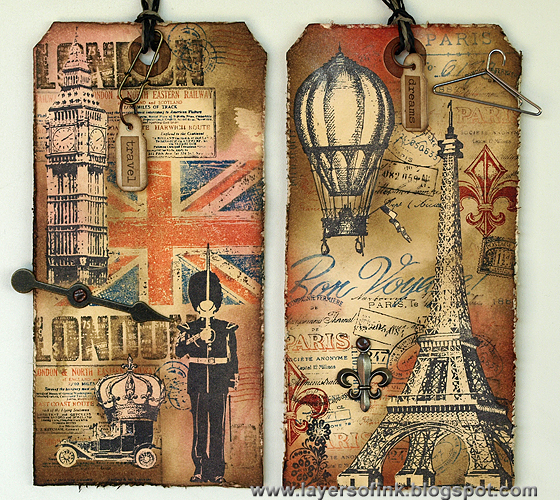 It was die cut from Tim Holtz French Industrial patterned paper, which is double-sided. 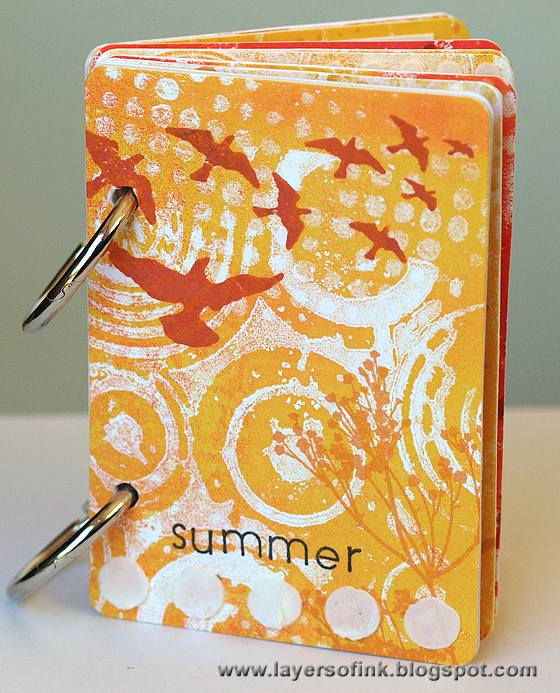 The base die also includes a swirl, which I die cut from kraft-core cardstock and sanded. 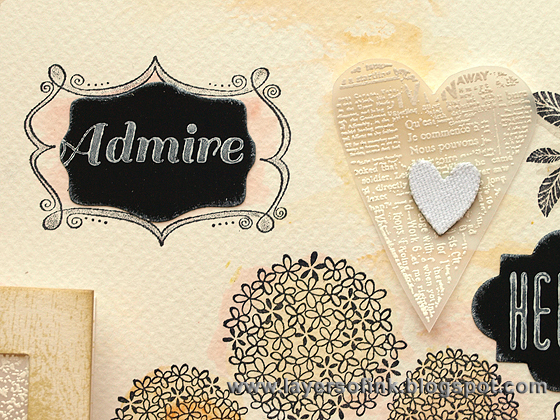 The little heart was die cut from mat board and embossed with Stampendous Aged Silver Embossing Enamel. When you open the flap, it looks like this. You can place a paper behind the opening, but here I wanted to leave it open so that you can see the background. All I did was to stamp a ruler stamp and use that as a spine. 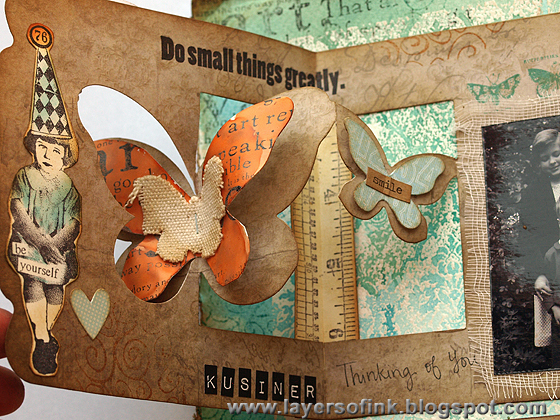 The smaller butterfly is layered with a butterfly die cut from patterned paper and a Chit Chat sticker. The girl was stamped with Jet Black ink and coloured with Distress Inks. 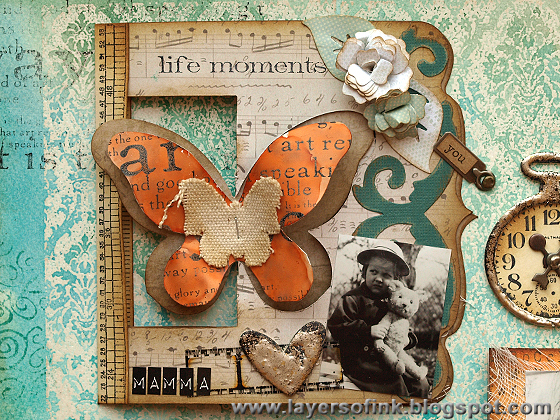 The orange butterfly was die cut from Wendy Vecchi's white modeling film, using the Butterflies & Labels die. I coloured it with alcohol ink and stamped with an art quote stamp. It was heated with my heat gun and shaped. Modeling film keeps its shape perfectly. It was stapled to the pop-up together with a canvas butterfly. The second pop-up is the Friend 3-D Phrase. This time, I used the Horizontal A2 base die and to cover up the cut out part of the label on the front, I cut a spine from manila cardstock, using the ornate edge from the square base die. It was inked and stamped. The butterflies were stamped with Peacock Feathers. The word was inked with Distress Inks, and I stamped a 's' on the small heart. 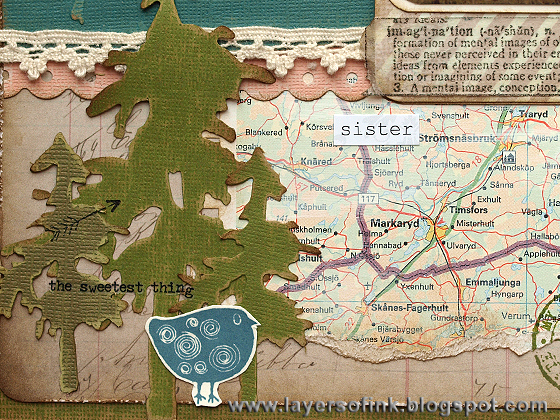 There is a coordinating Sizzlits die, which also includes a 's', but I didn't have it yet when I made this layout. 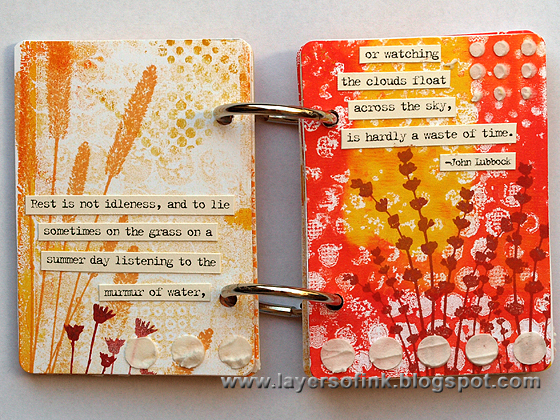 You can see how I used it in this mini-book. 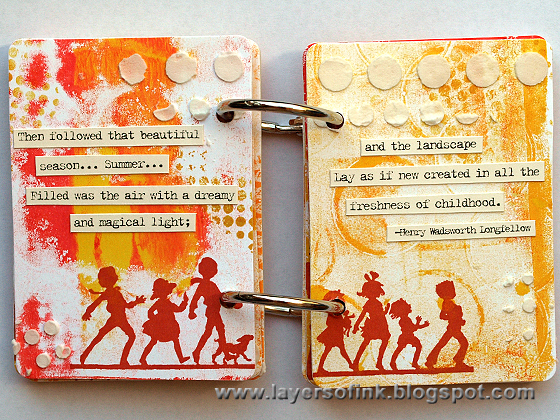 The marching children stamp is a favourite of mine from Hero Arts and the sentiment comes from Artistic Outpost. I repeated the swirl stamp on all the pop-ups to bring them together. The third pop-up hides under this flap and was also die cut using the horizontal base die. Again, I cut an extra cardbase from manila cardstock, to hide the opening behind the pop-up. It was inked and stamped, and die cut with the ornate edge from the square base die. The heart was heat embossed with Aged Silver powder. 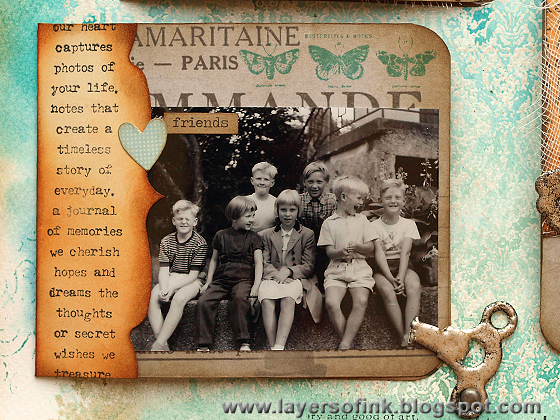 I used some of my mom's childhood photos for the layout. 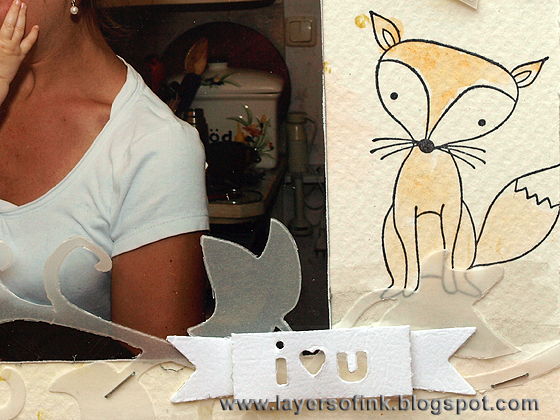 For this one, I used the Funky Label pop-up and also die cut a photo with a smaller sized Funky Label Framelits. A layered butterfly was attached to the pop-up with a wire, so that it looks like it is fluttering above it. All the little hearts were die cut with the Flower & Heart die. 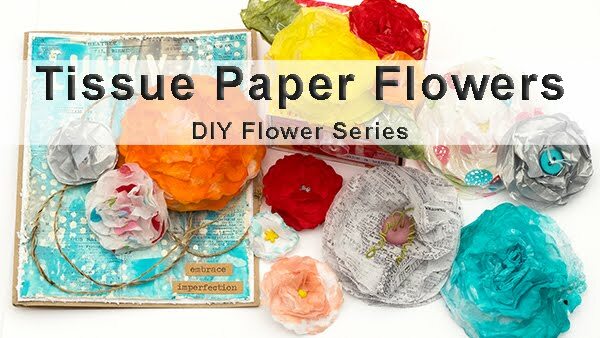 The dimensional flowers were made with the Bloom w/Leaves 3-D Flower, die cut from patterned paper, inked and rolled (check this tutorial for another example using these flowers). The watch was die cut from grungeboard and embossed with Aged Silver. The clock face was stamped on manila cardstock and inked. I rubbed white paint into the words on the word band. These butterflies were also die cut from white modeling film, inked with alcohol ink, stamped, heated and shaped. I love the dimension you get with the modeling film.